“Bosch,” the upcoming Amazon drama based on Michael Connelly’s long-running series of novels, has the look of a gritty and authentic Los Angeles, seen through the eyes of those charged to protect it. Front and center in the title and the show is Harry Bosch himself. So it should come as no surprise he’s the one and only star of the exclusive poster below. Shown in stark black and white, Welliver looks to his right toward the source of the light casting a glow on his face, gun and badge. Overlaid on top of the image is “Bosch” in bright red letters, with a hint of green from the Amazon logo underneath. Though simple, the image is memorable and attention-grabbing. How much it implies about the series’ attitudes toward police work remains to be seen. One could infer from the poster Bosch is trapped somewhere between the darkness (behind him) and the light (shining down somewhere in front of him), creating a gray area where law must be enforced. The pilot introduced a problematic court case for our central character based around his deadly shooting of an unarmed suspect. This, combined with recent events, could make for a series as complex as it is relevant. 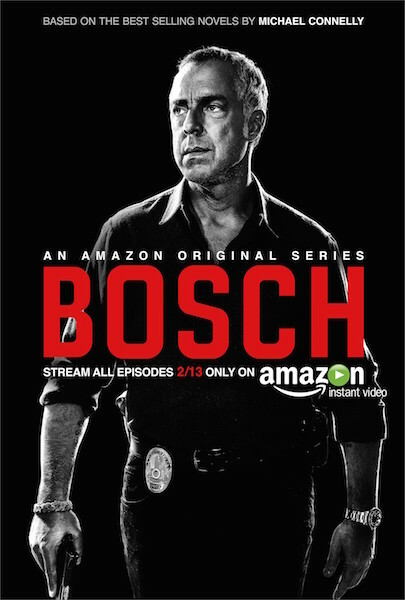 We’ll find out if it pays off on February 13 when “Bosch” premieres exclusively on Amazon Instant Video.